I’m sure it could be true, so it’s worth sharing even if it is an urban legend. The centerpiece of this legislation includes creating a group of officials to regulate “systemic risk.” Unfortunately, instead of advancing transparency and empowering investors, it will do very little to address systemic risk, while adversely affecting many of America’s most successful non-financial businesses. In fact, combined with other provisions of the bill, government officials will be in a position to substitute their judgment for that of investors. …The fundamentally wrong conclusion…, now seized upon by the Administration and politicians on both sides of the aisle, is that another, cleverly designed government institution is the prescription for our present ills. Given that most of the “bailed out” institutions were the most tightly regulated, even in terms of capital standards specifically designed to prevent the kind of bank run we witnessed, the “safety and soundness” approach to bank regulation itself needs to be reexamined. The end result of this traditional regulatory approach is that government bureaucrats tightly control the information that investors can learn about a financial institution, limiting proper analysis. …The bill proposed by Senator Christopher Dodd, along with the Treasury and House versions, simply doubles down on this same approach. The proposals seek to extend bank-style regulation to any American company that is deemed to be systemically significant – a “threat” to the financial system. The powers extend to companies and, ultimately, financial products. The new regulatory body is to be both omniscient and omnipotent – supposedly able to predict future market excesses and use sweeping powers to stop them. If the bill becomes law, two outcomes are likely: the systemic risk regulator will prove as incapable of predicting the future as everyone else in history, and the regulator will prove so overly cautious that it prevents financial market innovation and stifles economic growth. Some blame capitalism for being inherently unstable. Some blame Wall Street for its greed, hubris, and stupidity. But greed, hubris, and stupidity are always with us. What changed in recent years that created such a destructive set of decisions that culminated in the collapse of the housing market and the financial system? …public-policy decisions have perverted the incentives that naturally create stability in financial markets and the market for housing. Over the last three decades, government policy has coddled creditors, reducing the risk they face from financing bad investments. Not surprisingly, this encouraged risky investments financed by borrowed money. The increasing use of debt mixed with housing policy, monetary policy, and tax policy crippled the housing market and the financial sector. Wall Street is not blameless in this debacle. It lobbied for the policy decisions that created the mess. 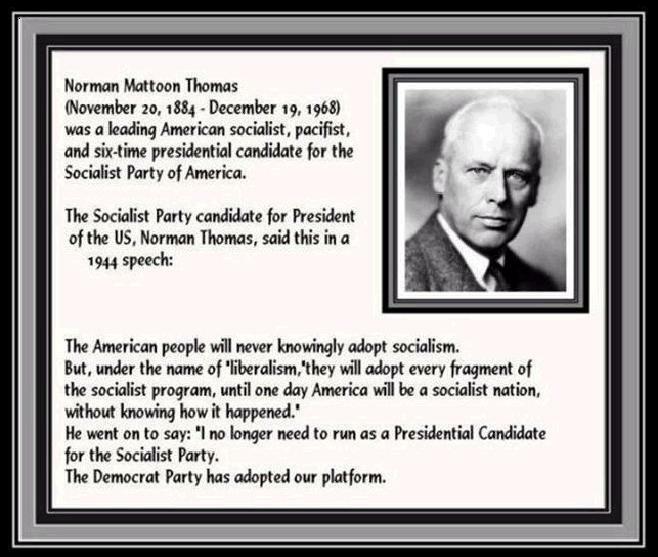 In the United States we like to believe we are a capitalist society based on individual responsibility. But we are what we do. Not what we say we are. Not what we wish to be. But what we do. And what we do in the United States is make it easy to gamble with other people’s money—particularly borrowed money—by making sure that almost everybody who makes bad loans gets his money back anyway. The financial crisis of 2008 was a natural result of these perverse incentives. We must return to the natural incentives of profit and loss if we want to prevent future crises. It is far from clear whether Athens will agree to further austerity as strikes hit the country day after day. Andreas Loverdos, Greece’s labour minister, said the EU-IMF team wants further wages cuts. “We cannot accept that.” Greece knows it can opt for default at any time, setting off an EMU-wide crisis and bringing down Europe’s banks. It also knows that key figures in the Bundestag favour debt restructuring. “Those who chased high yield by purchasing Greek debt must share the costs,“ said Volker Wissing, chair of Bundestag’s finance committee. Leo Dautzenberg from the Christian Democrats said banks should prepare for a `haircut’ of up to 50pc. The ECB, Brussels, and the IMF have been fighting feverishly to head off such a move, fearing a financial chain-reaction. If the Germans have any brains and pride, they will tell the Greeks to go jump in a lake (other phrases come to mind, but this is a family-oriented blog). And if this means that German banks take a loss on their holdings of Greek government debt, there’s a silver lining to that dark cloud since it is time for financial institutions to realize that they should not be lending so much money to corrupt and wasteful governments. I arrived in Madrid yesterday for a speech to the annual Convention of Independent Financial Advisors, and it is somehow fitting that Spain was downgraded by Standard and Poor’s as I entered the country. I’m not a fan of the bond-rating agencies, and the fact that it has taken so long for Spain to be downgraded simply reinforces my skepticism about their value. So let’s focus instead on identifying the sources of Spain’s fiscal crisis. If you look at the OECD’s fiscal database, you will see that Spain’s short-run problem is solely the result of a growth in the burden of government spending. Over the past seven years, the budget in Spain has skyrocketed from 38.4 percent of GDP to 47.2 percent of GDP. And since tax revenues have stayed the same as a share of national economic output, it is difficult to see how anyone can conclude that the fiscal crisis is the result of inadequate revenue. In the long run, the problem also is excessive government spending, largely because demographic factors such as an aging population will push up outlays for pensions and health care. European and International Monetary Fund officials on Wednesday were considering a dramatically increased $158 billion bailout package for Greece as the country’s debt crisis continued to ripple across Europe, with Standard & Poor’s downgrading the credit rating on Spain, the continent’s fourth-largest economy. …In Europe, the most intense focus remains on Greece, but fears were intensifying elsewhere, especially in Portugal and Spain. Though analysts noted that both countries are in better shape than Greece — with lower ratios of debt — they both shared large fiscal deficits and poor long-term economic prospects. On Wednesday, the government in Portugal announced that it would move up a program of painful spending cuts to shrink its budget deficit and shore up confidence amid signs that fearful depositors were moving capital out of Lisbon banks. After lowering Greek debt to junk bond status on Tuesday, Standard & Poor’s kept Spain at investment grade status, but lowered its rating one notch, to AA. 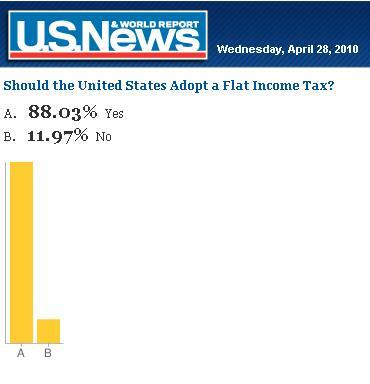 It doesn’t mean anything, and it definitely wasn’t a scientific survey, but more than 88 percent of the people who voted in the U.S. News & World Report poll on the flat tax vs. the current system chose my side of the debate. To be sure, a dead skunk in the road would beat the current tax system, so I’m not letting this go to my head.